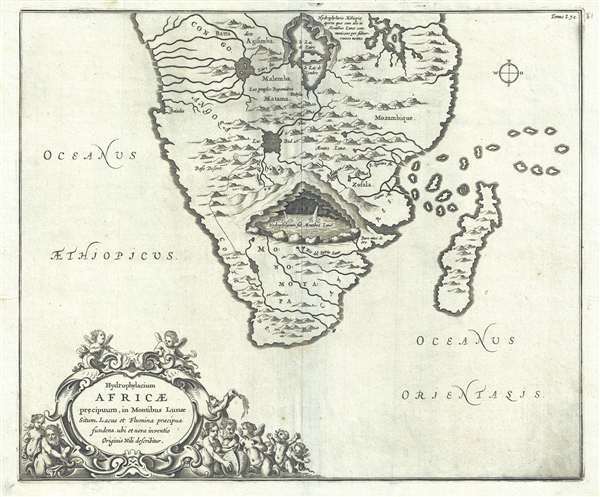 One of the first scientific-thematic maps of Africa - here illustrating the hydro-geographic theories of Athanasius Kircher. Hydrophylacium Africae precipuum, in Montibus Lunae Situm, Lacus et Flumina praecipua fundens, ubi et nova inventio Originis Nili describitur. On the 21st April in the year 1618, being there with the King and his army, I ascended the place and observed everything with great attention: I discovered first two round fountain each bout four palms in diameter, and saw with the greatest delight what neither Cyrus, the King of the Persians, or Cambysis, nor Alexander the Great, nor the famous Julius Caesar could ever discover. The two openings of these fountains have no issue in the plain on top of the mountain but flow from the root of it. The second fountain lies about a stone-cast west from the first: the inhabitants say that this whole mountain is full of water and add that the whole plain about the fountain is floating and unsteady, a certain mark that there is water concealed under it. Of course, Paez was referring to the source of the Blue Nile, later discovered by Bruce in Ethiopia, far to the north of this map's coverage. Although Kircher's theories were revolutionary at the time, they seem simplistic, even ridiculous to us today. Nonetheless, Kircher's maps were among the first thematic maps to attempt to scientifically illustrate and explain global geological and oceanographic phenomena. This map was issued to accompany the 1665 edition of Kircher's Mundus Subterranous. Kircher, A., Mundus Subterranous, (Amsterdam) 1665. Very good. Original pressmark visible. OCLC 163838784. Norwich, O. I., Norwich's Maps of Africa: An Illustrated and Annotated Cartobibliography, no. 157.